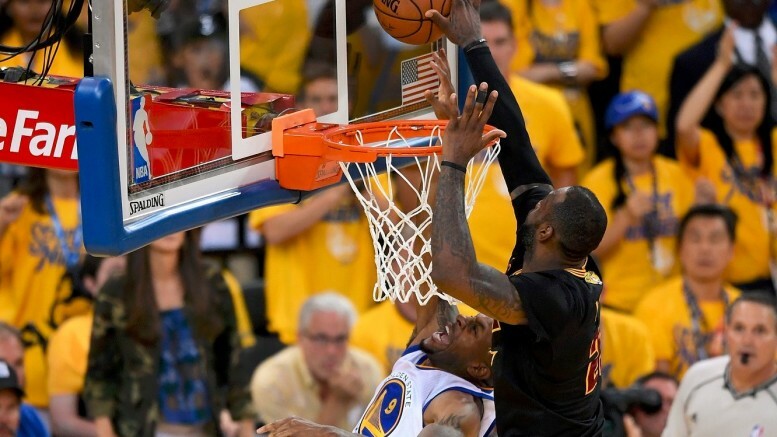 LeBron James' remarkable block helped propel the Cavaliers to their first NBA title. The comparisons were inevitable – the 2015-16 Golden State Warriors are basketball’s version of the 2007 New England Patriots and, thus, LeBron James is the Eli Manning of the NBA. Or something like that. But actually, it’s another NFL team that fell seconds short of glory in Glendale, Arizona, that may compare more favorably to the oh-so-close Warriors: the 2014 Seattle Seahawks. The Patriots comparisons are easy because both teams set regular-season records for wins, featured the league MVP, and had a lead late in a potential title-clinching game. But there are a few more reasons to think about Pete Carroll’s 2014 bunch more closely resembling the Warriors. For starters, the Seahawks, like this year’s Warriors, were defending league champions on the verge of a virtual dynasty. The Seahawks completely dismantled Peyton Manning and the league’s best offense in Super Bowl XLVIII, so they entered Super Bowl XLIX theoretically unfazed by Tom Brady and the Patriots. The Warriors had no problems with the undermanned-yet-LeBron-possessing Cavaliers in 2015, so the confidence was there that they could do it again in 2016. You could argue that neither the Seahawks nor the Warriors even deserved to be in the Super Bowl or NBA Finals because of the improbable collapse that was required by an opponent to get there. For the Seahawks, a late Russell Wilson interception down 19-7 appeared to seal their fate. Somehow, some way, the Seahawks rallied for two touchdowns, sandwiched between a botched onside kick by the Green Bay Packers, to steal the NFC Championship Game when Wilson connected with Jermaine Kearse for a 35-yard touchdown in overtime. For the Warriors, it was the unlikely meltdown of the Oklahoma City Thunder after taking a 3-1 series lead in the Western Conference Finals that opened the door for a chance for the Warriors to repeat as champions. In both cases, the teams appeared to head to the sport’s biggest stage with a ton of momentum after big comebacks in the semifinals. And in both cases, that momentum could not be sustained. The Seahawks led 24-14 in the fourth quarter of Super Bowl XLIX, with 10 points representing the biggest lead ever squandered in a Super Bowl. The Warriors led 3-1 in the NBA Finals, with no team ever having blown a 3-1 lead in this round in league history. But both the Seahawks and Warriors ran out of gas, and were burned by the two biggest names in sports in Tom Brady and LeBron James, respectively. The MVP of their respective game/series came through in the clutch to deny the Seahawks and Warriors a repeat title. The city of Cleveland is still rejoicing after its first professional sports title since 1964, and an end to the supposed “curse” that existed. Eternally-spoiled Patriots fans were celebrating after having to wait 10 whole years for a fourth Super Bowl title. It’s only been a year-plus for the Seahawks, who went 10-6 last year and lost in the divisional round of the NFC playoffs. It remains to be seen how this impacts the Warriors moving forward. Be the first to comment on "2016 Warriors are more like the 2014 Seahawks than the 2007 Patriots"